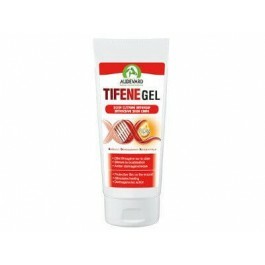 Tifene Gel has been formulated by AUDEVARD Laboratories for horses requiring intensive skin care. Also suitable for use on dogs. The condition of the skin is a significant aspect of a horse’s health, and plays a role in performance and aesthetic appeal. The Tifene Gel formula combines seven concentrated essential oils and hyaluronic acid, in an isotonic gel base, which forms a protective film as it dries. A bandage can be placed over the area where Tifene Gel has been applied, if required. Forms protective film as it dries. Composition:Hyaluronic acid, centella (Centella asiatica—ext. ), sage (Salvia officinalis—ext. ), lavender (Lavandula officinalis—ext. ), marigold (Calendula officinalis—ext. ), oregano (Origanum officinalis—EO), thyme (Thymus zygis—EO), marjoram (Origanum majorana—EO). Intensive skin gel - Hydrogel made from plant extracts and hyaluronic acid. Forms a protective film to act as a barrier for the skin (dryness, dust...). Hygiene product for horses and dogs. Instructions for use:clean the concerned area daily with warm water or physiological saline solution only. Apply a thick layer 2 to 3 times per day. Non-doping formula.